The Co-operative childcare, (CC), has 45 nurseries across the United Kingdom. CC’s mission is to provide communities with high quality early years childcare and education in line with its key values. With 45 nurseries, CC has a successful business but they wanted a more detailed understanding of its customers/parents across all nursery locations to better understand how to serve their customers in the varied communities they service. CC was looking for an agency who could work with them to provide a thorough understanding of their customer base and to provide additional strategy and creative where required. 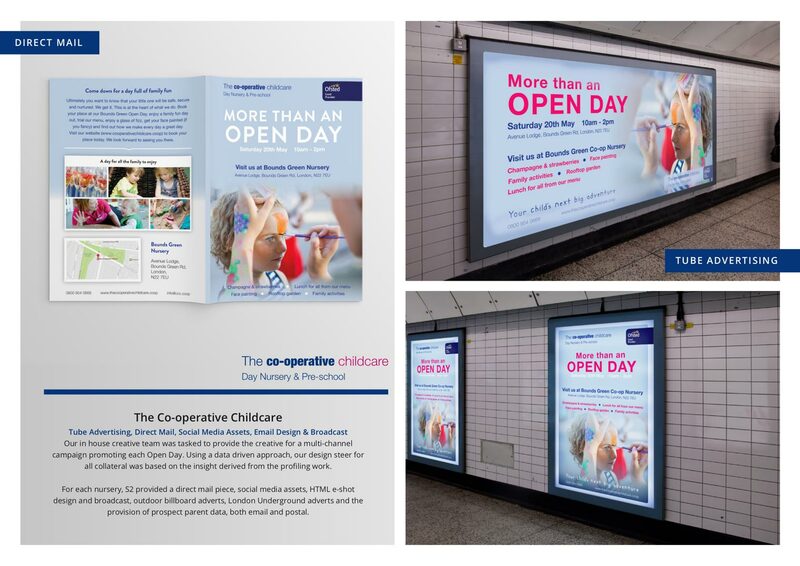 After an initial customer profiling and customer segmentation project, S2 was asked to work with CC on a multi-channel creative campaign to promote and drive footfall for 4 key nurseries holding open days. CC had a gut feel for who their parents were, but did not have a detailed understanding of the precise make up of its customer base or how to find more people like them. S2 began by analysing parent data for 17 nurseries across the CC portfolio. Data for each nursery was profiled against MOSAIC consumer classifications to provide a profile of parents or carers for each specific location. S2 developed bespoke pen personas that grouped similar types of parents across the total estate, but then for each individual nursery. This customer segmentation and persona development brought to life the types of parent CC has across the estate and also highlighted their communication preferences. Analysis and mapping of parents around each location derived bespoke catchments for each nursery and identified potential target areas of new prospects who share similar characteristics. This insight was then used to drive marketing activity for open days for 4 specific nurseries by advising CC on the most appropriate media channels and messages for each nursery’s specific target market. 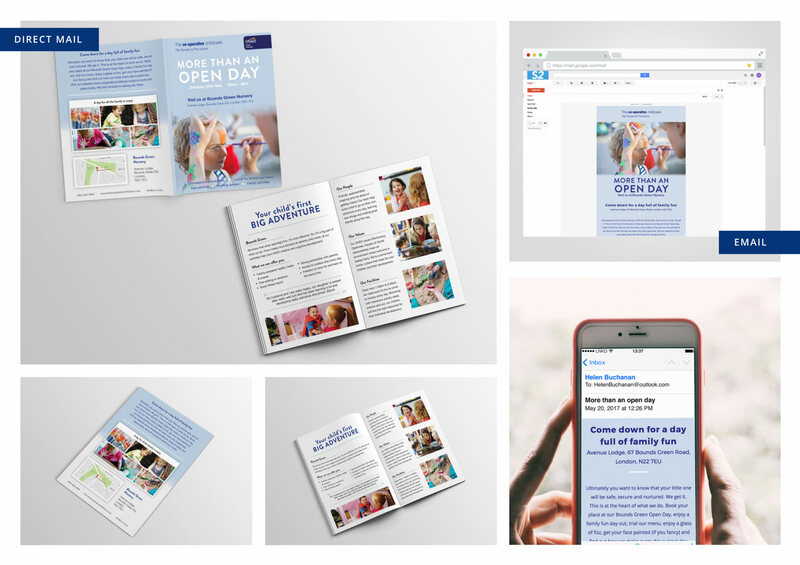 Using a data driven approach, we then developed the creative for a multi-channel campaign promoting each Open Day. For each nursery, S2 provided a direct mail piece, social media assets, HTML e-shot design and broadcast, London Underground adverts and the provision of prospect parent data, both email and postal. CC now has a good understanding of their parent base both at group level and at each individual nursery. With the development of CC Personas, future sales and marketing campaigns can now be aligned to specific audiences to increase parent acquisition and retention. S2 continue to work with CC on other nursery locations.